After many years of doing a lot of reviews on Sitecore I would conclude that it more or less always comes down to one single thing when pages perform badly: bad code. And when I mean bad code, I mean code iterating an excessive amount of items. Previously we used to see a lot of calls to descendants when solutions were using axis, xpath or Sitecore Query, but luckily this is a disappearing trend with the introduction of Sitecore Search in Sitecore 7. This does not mean that there are less bad code – maybe even on the contrary. The use of ORM and abstractions in many solutions means that layers of code can easily hide item iterations. Neither of the two patterns or technologies are inherently bad, but they do provide means to hide “bad code”. The example in the diagram below is from a customer here in Australia which had a problem with a very slow running product search. 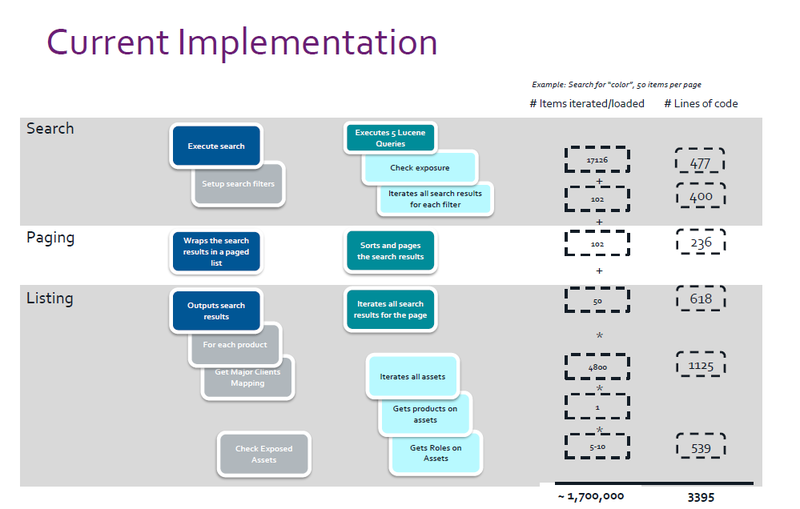 The diagram breaks down the different parts of the search page and describes the functionality and number of items hit by each part. It was part of the presentation to the client to highlight where the performance bottleneck was (and that Sitecore itself was not cause of the problem). After looking through layers and layers of code (3000+ lines to be more specific), we discovered that the code in the different layers were searching Lucene and iterating search results, loading the items individually and recursively running business logic. To cut the very long story short: always keep an eye on number of items being iterated – and never rely on caching to do the trick. I’ve recently been made aware of how type-centric Sitecore is in its architecture and best practices. Consider the main sections in Sitecore: Content, Templates, Layouts, and even the folder structure /xsl, /layouts. Sitecore seems inherently to point the architect towards categorizing his solution after which types of elements it consists of, i.e. which templates do my website consist of, how many layouts do I have, which XSL’s do I have to write etc. instead of looking at the conceptual structure of the website, i.e. which functionality do I have, e.g. newsletter, document, navigation etc. Trying to piece together all the parts which make one function on the website involves browsing through a lot of folders in Sitecore and looking into a lot of code, whereof many of the references are very loose e.g. template names in XSLT files, or assembly references in the web.config (or even worse: assembly references in Sitecore). All in all it is not an architecture which is very helpful for reuse and overview. …and that’s it. No more browsing the entire tree looking for the settings for the Mailing list module. No more: “I wonder if this layout is used by any of my 367 templates”. No more: “Was that document.xsl or document.ascx”. Just imagine the ease in making of package for porting functionality to a new website. Ever considered putting environment specific configuration in the Sitecore database? …well don’t. In the official Mailing list module, Sitecore has, among others, placed the database connection string and we have nothing but grief from it. Consider moving from development to test to production, or in the latest example a customer wanted to have an internal test site nightly updated with the production database. Sigh!